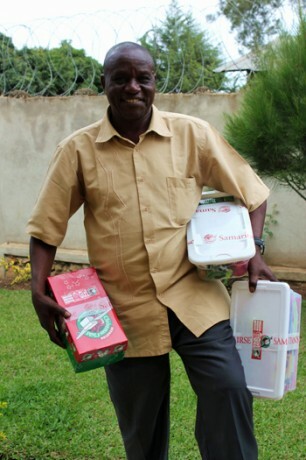 Pastor Obed Mukanirwa is the ministry coordinator for Samaritan’s Purse in the Democratic Republic of the Congo. In the Democratic Republic of the Congo, our ministry team helps church leaders through discipleship training, seminars, and a three-month portable Bible school. 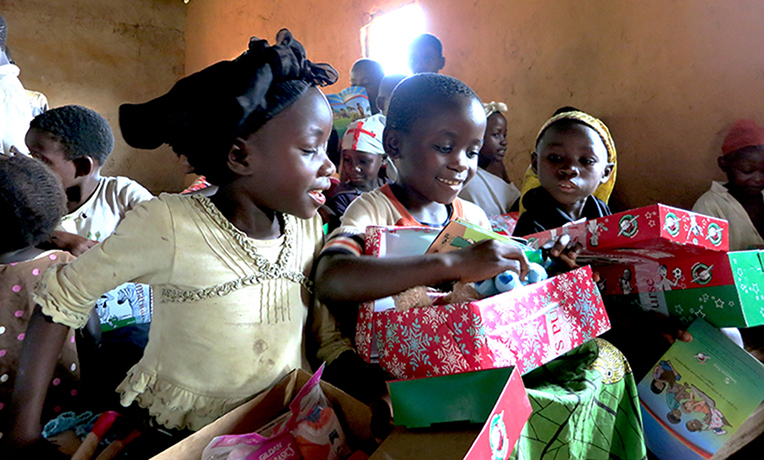 Before the Bible school program closed in August, we distributed Operation Christmas Child shoeboxes to 100 children from local churches and the surrounding areas. Dramas, songs, and a short message on Jesus as the greatest gift ever were presented to the children in the presence of a number of parents who also attended. All the spectators were astonished and overjoyed to see how the presents came so far to reach children in another land without the senders even knowing to whom the gifts would be given. I was touched by how this truly shows God’s love for those who are far from Him and still in darkness. After they received their gifts, children were encouraged to return home and testify about what they had seen and heard. They accepted our challenge! We’ve witnessed them sharing the message with their friends and family. It’s amazing how children can be the best at obeying the commission to share the Gospel; they can be true witnesses of Christ when our churches give them discipleship training through The Greatest Journey. Because of the testimony in Mambasa, we’re convinced that children can be powerful evangelists in our churches. They’re willing to go where we, the adults, would never bother to enter. I believe we must encourage this ministry among children if we want a real church that has the disciples of Jesus. The Church, which should be the light and salt of the world, will only be a reality tomorrow if we devote ourselves to training up the youth in our churches, right from the start, today. Operation Christmas Child Through our Operation Christmas Child project, God has given us unparalleled opportunities to touch the lives of millions of boys and girls in over 150 countries. Many of these children have never received a gift and never heard the true meaning of Christmas—until they open shoeboxes filled with gifts from people like you. Some of these gifts are packed by young children or people on fixed incomes who simply cannot afford to include the $9 we request for international shipping and related costs. 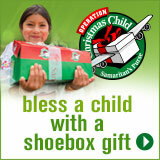 When you adopt a shoebox, you are partnering with them to deliver their gifts and show God’s love to a precious child.